[...] This study is divided into two parts and four chapters. The first chapter of the first part has an introductive character, mostly general and is dealing with the above interaction of the social policy and the gender equality, emphasizing in the substance of the social rights and their dependence upon a state's budget. Also, in it, the continuous effort of the European Countries to establish a solid system of social rights almost around Europe - at least in the Council of Europe and in the European Union -, is examined offering the proper material for any further special analysis or commendations. Additionally, in the second chapter of this same part, the principle of gender equality is examined relying upon the two basic principles that govern the theoretical justification of the system of the protection of human rights. The principles of equal treatment and of the non-discrimination are prevailing in any system of human rights whenever a state's legislation would provide. The separate Protocol 12 to the European Convention for the Protection of Human Rights and Fundamental Freedoms dealing with the "general prohibition of discrimination" consists a certain evidence of these principles' prevailing character and authorises any attempt of further protection of human rights. On the contrary, the other two chapters of the second part are devoted in specialized issues about gender equality. First, taking into consideration and admitting that the waves of migrants in European Countries are mainly increasing, after 1990, we could agree that their presence is pressing the local societies, menacing their cohesion and intruding to their economic, social and cultural equilibrium. So, the confrontation of these problems in time comes first whenever facing them. The common ground of these efforts would aim at reversing the whole negative situation into positive results for both sides. Namely, the elaboration of suitable policies would serve the evaluation of the above presence into assets, useful for development, for the evolution of multi-cultural societies, for tolerance and for a precious example in peaceful coexistence among people from different states. The examination of the adopted policy and the applied measures, facing these disadvantages, made by the European Union is of great importance and interest from this very general point of view, but, also, for the situation of migrants-women in the European Countries. 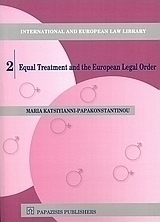 Second, the Greek report on the situation of women's social rights has given a representative example of a medium-sized and medium-developed European Country with problems coming from the adaptation of modern policies and the imposition of European regulations and directives facing women's social rights. Γράψε μια αξιολόγηση για το Equal Treatment and the European Legal Order και βοήθησε σημαντικά τους άλλους χρήστες!